Though its natural habitat is shrinking in the Caribbean, a brownish-gray songbird twice discovered on top of Vermont’s highest mountain is giving scientists hope, Lisa Rathke reports for the Associated Press. 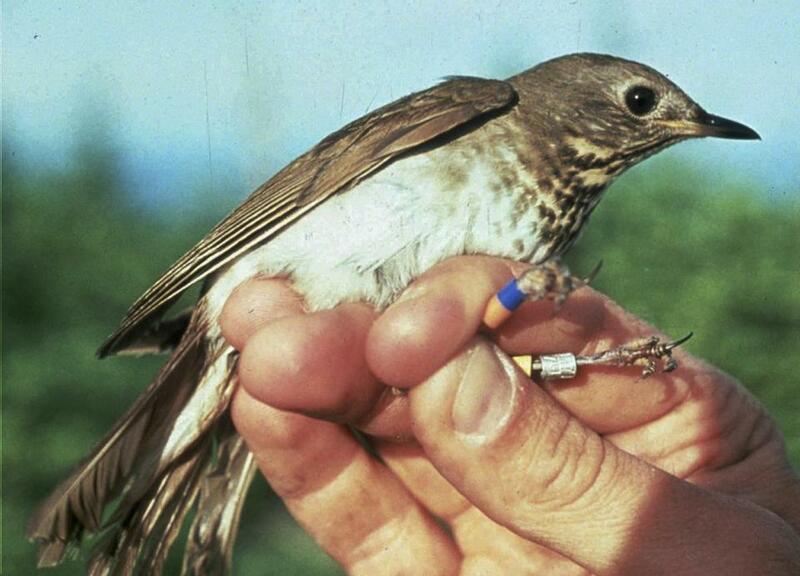 Just weeks ago, researchers identified a Bicknell’s Thrush on Mount Mansfield that had been banded in the Dominican Republic while wintering there in 2010. It was the second time since 2010 that the bird had been captured on the mountaintop as part of research. “The chances of that are amazingly small and to have that happen is not only just remarkable and very cool … it’s really compelling because it shows you that we have to pay attention to both ends of this bird’s range if we’re going to conserve it,” said Chris Rimmer, executive director of the Vermont Center for Ecostudies. The vulnerable species has an estimated population of 100,000 worldwide. The migratory birds nest and breed in coniferous forests in northern New England, the Adirondacks and eastern Canada, then fly south to winter in the Caribbean. Dominican Republic conservation and government workers explored the bird’s Vermont mountain habitat on Friday and spent the week learning about research being done on Bicknell’s Thrush. “We’re working with them to build their capacity and help them secure more resources so they’re equipped to create some additional protected areas,” Rimmer said of the visitors. Like other birds and their habitats, Bicknell’s Thrush is an indicator of the health of the Northeast mountain forests in the face of climate change. If scientists can determine where the birds are breeding and whether particular events are threatening the population’s wintering grounds in the Dominican Republic and Haiti, they can target the conservation effort in those places, Dettmers said. Scientists have found a disproportionate number of males to females on the mountaintops in the Northeast, with sometimes two or three males feeding chicks at the nest. In the Caribbean habitats, researchers found that males and females are choosing different places to winter. The male birds are found in more pristine, undisturbed higher elevations — moist cloud forests — that apparently have a variety of insects, the bird’s preferred food. The female birds are more concentrated at lower elevations, wetter forests more affected by humans and apparently with less diverse and abundant insect populations. These birds feed more on fruit, Rimmer said. “They may not be doing as well because there’s been so much habitat lost down there, so much deforestation and degradation of the forest that there just isn’t enough to go around,” Rimmer said of the Caribbean island countries. The Fish and Wildlife Service is looking into collaborating with conservation groups and exploring ways to have more government-to-government conversations, Dettmers said. “What we’re really realizing is that with a lot of these bird conservation issues in those parts of the world, it really comes down to human issues. And so we’re looking for ways that we can collaborate with folks who are thinking about human development and how that can be coupled with ecological conservation that would benefit our bird conservation interests as well,” Dettmers said.